If you asked any manufacturer to list the factors most essential to successful manufacturing, you are likely to hear terms like quick, efficient, accurate. This is especially true for companies who specialize in food, pharmaceuticals, and other closely inspected products. 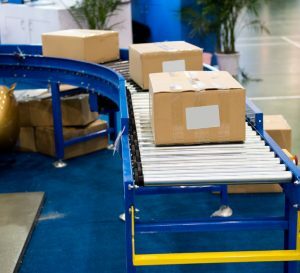 Though they might sound old-fashioned, conveyors actually play a significant role in an quick, efficient,and accurate manufacturing process. How Do Conveyors Function in Manufacturing? Conveyors have advanced dramatically since Henry Ford introduced the first conveyor-belt assembly lines in 1913. Today, conveyor belts automate and streamline virtually every small function of packaging. This includes the movement of parts and products, sorting items, weighing, and monitoring loads. Everything that a conveyor does is designed for smooth packaging flow and high-quality results. When packaging occurs in a reliable and superior way, the benefits of higher productivity and better performance can be seen. Not to mention, the risk of damaged goods and waste resources declines. Conveyor systems can enhance productivity and packaging efficiency in three key ways. First, conveyors minimize the risk of workplace accidents by automating the majority of tasks. Without the dangers involved in manual movement of parts and products, the packaging process can continue uninhibited by human error. By supporting better workplace safety, your company will protect its workers, improve morale, and reduce expensive downtime. Additionally, conveyors allow for higher accuracy and reliability. They move parts and products faster than could ever be accomplished manually while also maintaining a high level of accuracy. For manufacturers working with pharmaceuticals, electronics, and food products, accuracy is absolutely critical. Conveyor scales make it effortless to sort, weigh, track, and collect data to analyze. Finally, conveyor systems maximize floor space to make room for larger workspaces on the floor. Conveyors can be installed in overhead spaces and routed around obstacles, giving floor space to other, less versatile, technologies. This is a major benefit for packaging, warehousing, and distribution facilities. To learn more about cartoning, tray forming, and casepacking with conveyors, call (781) 986-7500 to speak with an expert at Econocorp. As a recognized worldwide leader in packaging, Econocorp offers ideal solutions for moderate and lower production volumes.